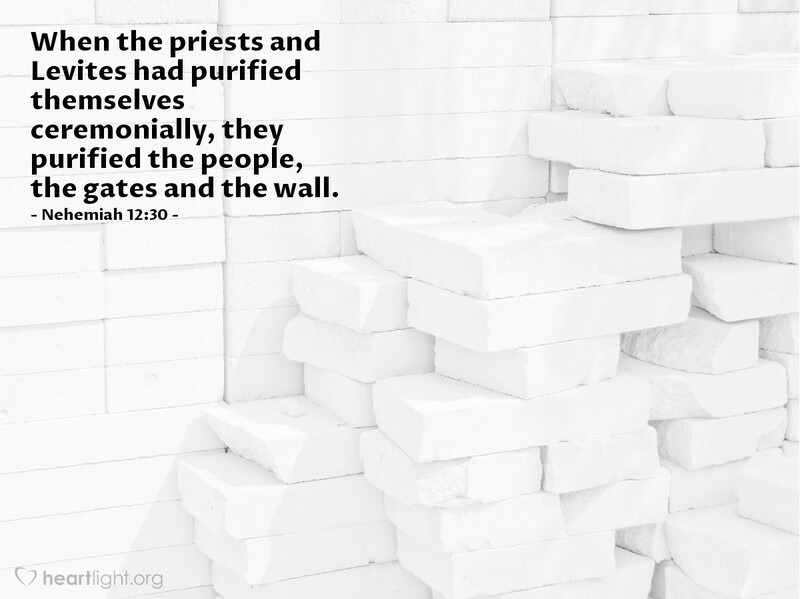 When the priests and Levites had purified themselves ceremonially, they purified the people, the gates and the wall. God has placed each of us in a circle of influence. Before we try to "clean up" those around us, let's first offer ourselves to God to be consecrated and to be made pure by his grace. Then, let's live in a way that shows the impact of that holiness in our lives. Jesus told us to remove the plank from our own eye before we try to clean the speck out of someone else's eye. For leaders at any level, "living holy" is essential before calling others to holiness! God's greatest times of spiritual renewal begin when leaders first consecrate themselves to God and his work. O Father in heaven, forgive me for my sins. I want to be pure and holy, cleansed by your Spirit and forgiven by your grace. Please bless me as I seek to live a holy life before those I influence. I need your powerful help to be the example and person of character that you want me to be, and that my friends need me to be. I ask this in the name of Jesus. Amen.